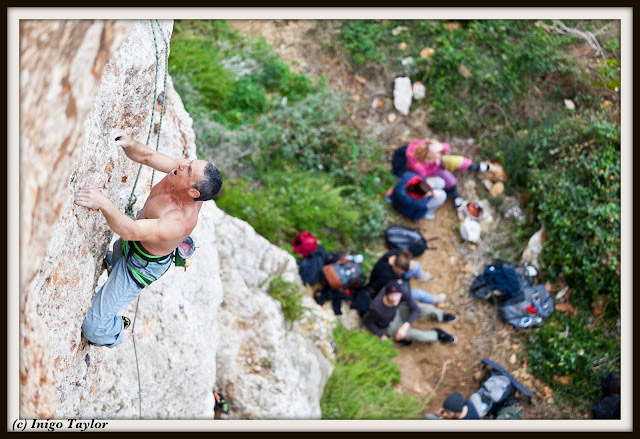 Thanks to Inigo Taylor for the pictures of Stevie climbing Apricot Tart. Behind most great deeds can be found simple hard work. Work is mundane, boring, sweaty, and sometime painful. People just admire the magic. I'm lying on the sofa in pain, my forearm are aching, my body is bruised, but my mind is content, for I'm starting to make magic. Climbing is one of the most magical sport there is, you can tame dragons, you can subdue huge overhangs, you can bend gravity to your will, all you have to do is work, work, work... And of course nobody want to do the work. Yesterday I was climbing with the Maltese climbing club, Maltese climbers and climbers from al over Northern Europe, all outstanded by the magic of climbing. But their magic is small, there are not powerful wizard, there are just baby wannabe wizard, but there are starting the journey. 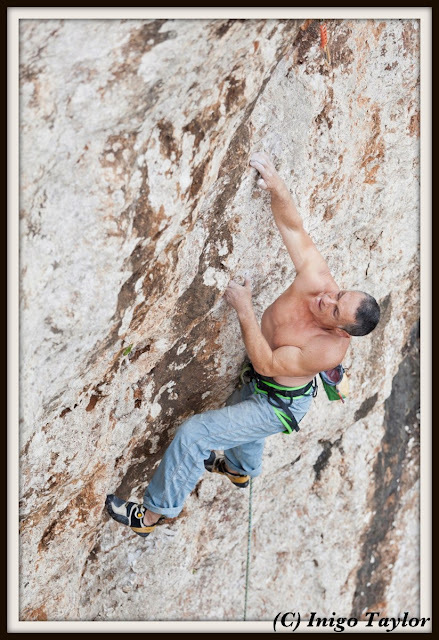 Ben Moon and Jerry Moffat once said that climbing becomes magic when you don't notice a certain difficulty of moves. When they said this, I felt insulted, because it was my level at the time, there were obviously correct! I was only a wannabe baby wizard. Now I'm the white grey hair powerful wizard, who has unnatural long life, and I have found the Ring that Gollum try to destroy. And indeed it is the Ring of power, it is a Ring of ever ending work, training and learning. It ain't just saying abracadabra....Long live the magic in climbing, we all need magic in our life, but don't ever forget the price of magic...you earn magic. ...... and I'm digging the snow to go to work...... Can't wait to go back to Gozo end of February! New years training Plan, by Stevie Haston. Resolutions and new plans, it happens every year, but some years you do them, they are the good years, you get some where. Well I am going to try. Maybe I am going to try real hard. Climbing has captivated me again, so it's worth all the sweat and pain. After a great year I realised I have miles to go in my climbing. I realized I need to be more flexible, you probably don’t understand this but it only came to me I was recently. My power is down, it needs to go back to its old levels, and I really desperately need stronger fingers, the good news is that it's all there, I am sure with a bit of training it will come. So bugger it, I’ll go for it again, why not it’s the only game worth playing. Right, who is with me, I can't do it by myself! Classic climbs, fine times. By Stevie Haston. 30 years ago I did the first ascent of a route called Comes the Dervish, and within a short while it became one of the great climbs of North Wales. I f you think I am boasting, I suppose you could be right, but I have been lucky and been a dedicated climber. The other day I was watching Jeff and Laurence trying Negresse Verte and new it was another gem. Laurence doesn’t do much nowadays because of her yoga work, but there she was tearing her self to bits trying to fight a bursting pump. Likewise Jeff, slowly crushing, until the pump crushed him like a walnut. Negresse Verte is a great route, it's mine, but it is yours, it's great. Last night I had some bad news, I lost an article for a mag and therefore I will be poor the next month, but I’ll think about Negresse Verte while I eat cheap crackers and feel warm inside. There are so many great routes in the world and you have to smile when you remember them, they are in weird corners of the world like Riglos Spain, Colorado, and now a few in Gozo. I was looking at some stone inlay work yesterday and marveling at the richness of the work, it was in a beautiful church. After a while it just faded, because I recalled all the fossils and weird colours on the new start to King of Kings, its just something only Dali could have come up with, but without the spark and span of a climber it lays hidden under the human world, in the Under world. Some climbs are just stupendous, some are simply divine, some stun you, I seem to have been walking around stunned for around forty years, no wonder no one understands me, but I have to say it, if you haven’t done Fiesta del Biceps, you are not rich, your life is poor, and bro you ain’t as rich as me! So we had a bunch of people down in the Underworld today, which was weird because it was kinda crazy weather. The last bolt was a special, very complex, computer designed bit of hardware from the worlds foremost manufacturer of space stuff. It took years to come up with its simplistic design, and although it looks like a bit of rusty water pipe, it is in fact both, electronic, and supersonic, and I bashed it mightily so it should be good. This photo makes me appear to be riding a broom stick, who knows? Well after Jeff went up and tested zee zinc pipe, coz I was too crafty, and cowardly, I had a go. It will go, and verily it will be good, but it won't give up without a fight, so I am looking foreword to a big battle. One of the visitors from a different planet dropping in on the Underworld. This titanic bit of thuggery will land you at the first crux of King of Kings, which is like a V7 thingy. And then if you do that, about 40 meters of bog standard heel hooks, knee bars, and Greek dancing Kosak throwing, will land you on a ledge. And 'Thats all Folks'. Doing a lot is normally doing too much. Your body can't handle it, and neither can your mind. Still it's fun to break your self to find where this line is, I am on that line. Climbing at the Underworld today, it rained some of the time, but we got in and out when it was dry, and inside it was exceptional conditions, tried some hard moves in some improbable places. Had to use my imagination in places bolting thru a layer of Ricotta cheese. I hope I can do this route it's funky and burly. Bad split, put some vitamin E and tape it up. Little puppy abandoned, we sorted him out, he pissed on us both, in happiness. The little gap to enter the inner Underworld is not a place to slip. This cave goes back for a long way, there's maybe two weird pitches to do in the roof, starting with head torches. Have just extended King of Kings a bit! Added some muscular thuggery, got 7 weeks to red point it. 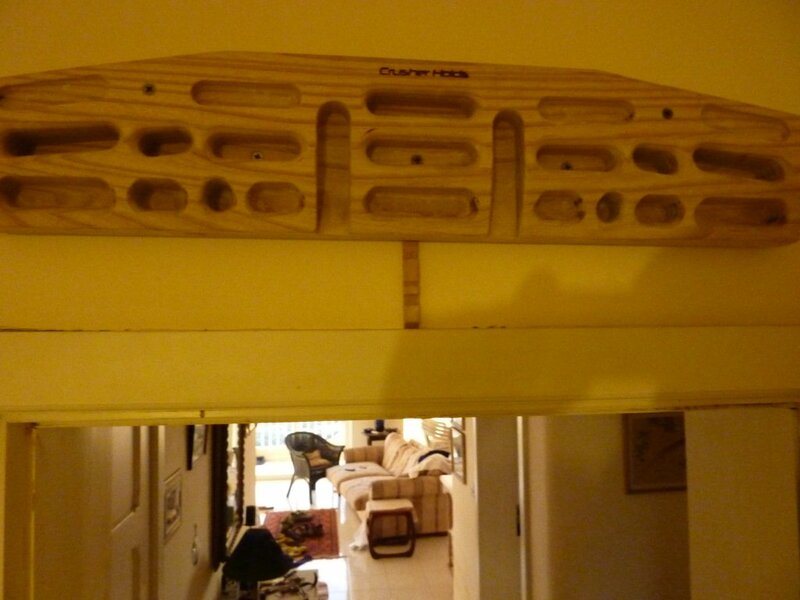 We will see, it's gonna be a wild one, I think I'll wire my fingerboard to give electric shocks if I touch a foot pad. 7 weeks, 49 days thinking, being absorbed by overhanging break dancing, haunted, imprisoned in the Underworld-lovely. Stevie took me to his new cliff, the White Tower, about 8 minutes from the flat! 30 meter routes of fantastic quality, about 30 routes! This is the line of Farse Bandit, Stevie is such a farce! Anyway, he said it's a grade 5, but it felt hard especially in the head, very atmospheric. This is Negresse Verte, one of the best routes you can do anywhere, felt like Ceuse, but on more interesting rock, 7c+, just super magic! Stevie had a good day, but I missed some great shot of him on a route called Straight Street. Crazy looking bridging and a weird complex crux. That deserves really great photos. New car for him who shall not be named. Perfect end to a perfect day. It rained when we were climbing but the cliff stayed dry. Top quality coffee, before and after, plus he who shall not be named is looking good, and thin, he might get good this year. Be about time! So I been bolting and climbing for the last month, it's been a bit frustrating with cold, and wind, and lack of partners, but it can always be a blue bird day like today. Today was the 1.1.2013, blue as blue, warm, a great day. I was bolting on 12.12.2012 and named a route after that number its damn fine and not nearly the end of the world. I bolted on 21.12.2012 and called that route after the number, it was no where near the end of the world, but later that night there was a power cut, and lots of people did actually think it was the end of the world. 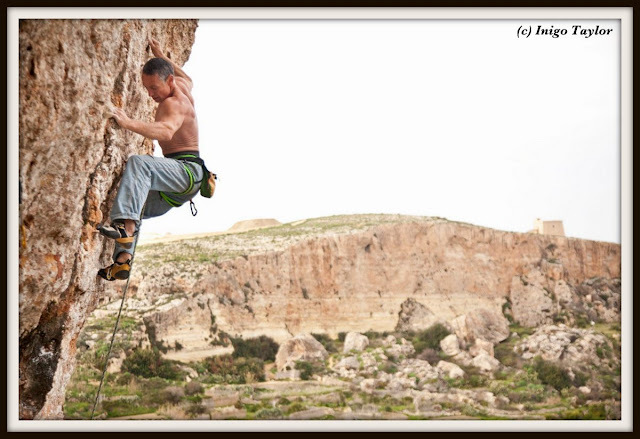 This is an 8a which I must say felt pretty tricky, it's on Malta not Gozo, with a sea view, lovely, balmy, warm breeze. 'Life is but a dream, merrily, merrily, merrily, we thug over roofs and gain the sanctuary of paradise.' Well for a moment, or two. I tried a project here, it nearly went, so there is something to do in the future, it will be nice to return. I hope you all are in the air, flying above the hum drum stuff.